If anyone needed more evidence of the Trump administration’s flagrant criminality, it came Tuesday morning when it responded to allegations against senior advisor Kellyanne Conway. She was just found by the Office of the Special Counsel (not related to Robert Mueller) to have violated the Hatch Act that prohibits White House personnel from engaging in political advocacy. Twice. That, of course, was totally untrue. Given her repeated breaches of federal law, and her absence of remorse, it is inconceivable that she would avoid punishment. Had an aide to President Obama done this, Republicans would be calling for his impeachment. Well, if Obama were caught jaywalking they’d call for his impeachment. But an unrepentant, recidivist federal law breaker like Conway doesn’t even get the proverbial slap on the wrist. Consequently, Conway’s punishment should be meted out in the only other venue that matters to her: the media. There is absolutely no justification for any responsible news enterprise to book this lawbreaker. It is on the news that Conway commits her crimes. So why provide her the opportunity to repeat her offenses? The victims of the Hatch Act are not just citizens who are deceived, but also news outlets that are exploited. So it is entirely appropriate for them to protect themselves and their audience from further harm. Considering the frequency with which Conway has lied to the press, they would have been justified in banning her even before these legal judgments. In fact, that’s just what the hosts of Morning Joe did last year. Now that banishment needs to be extended to the rest of the media. Since the criminals in the Trump administration believe that the law doesn’t apply to them, justice needs another outlet. Let Trump find someone else to lie to America. He has plenty of Deplorables around him who have no problem wallowing in that swamp. 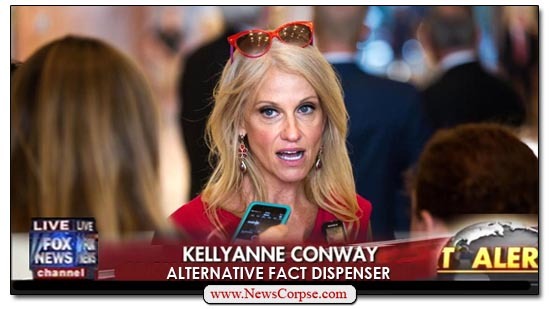 And leave them and Conway to Fox News where lying is a job requirement. There is something deeply disturbing about a president who obsesses about television ratings. Especially when it’s focused so narrowly on one particular network that serves as his biggest media booster. Donald Trump has spent more time on Twitter fawning over Fox News than almost any other single subject. He frequently tweets or retweets things he just watched on Fox and Friends or Hannity as if they were his closest advisors. On Tuesday morning Trump retweeted a post by his son Eric that celebrated Fox’s ratings performance in February. Why on Earth was this so important to someone who is currently burdened with a nuclear standoff with North Korea, Russian interference in American elections, a trade war that he instigated, children being massacred in schools, undocumented residents who have spent nearly their whole lives in the U.S. facing deportation, and so many other serious matters? It’s almost as if his only experience for running the country came from being a TV personality. Okay, so Fox had a pretty good month. They lost January, so it must be a relief to them – and to Trump. However, their February win wasn’t exactly a runaway. While Trump slams his arch-enemy CNN in this tweet, he neglects to mention MSNBC and Rachel Maddow. 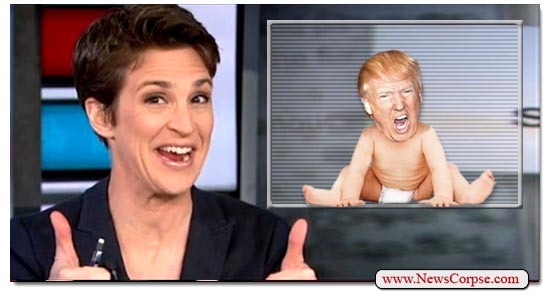 As News Corpse reported last week, Maddow had another impressive month, falling just short of beating Sean Hannity again in the key demographic of 25-54 year olds. And although her average audience was shy of an outright victory, she did win more days during the month than Hannity did. 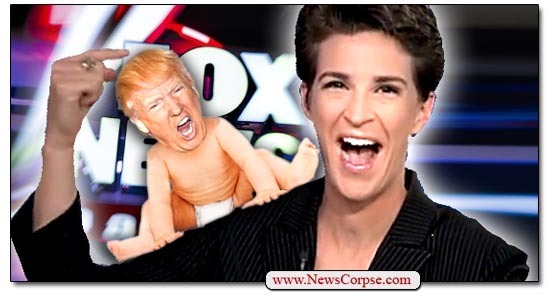 What’s more, in January Fox News dropped fourteen percent in primetime. Now February has topped that with an additional fifteen percent decline. Meanwhile, MSNBC gained significantly in both months of this new year. February’s percentage gains were over twenty percent. Funny, Trump never mentioned any of that. But he did tweet about the ratings for the Oscar telecast on Sunday. And for some reason he took delight in the numbers having declined. Apparently our President is happy when the film industry, a major national employer and contributor to America’s domestic and export economy, is doing poorly. If you’re a news organization and the folks in power are constantly praising you, you’re doing it wrong. By definition. And conversely, if you’re a news organization and the folks in power are constantly maligning you, you’re doing it right. By definition. There’s a reason that Trump is relentlessly attacking CNN, the New York Times, the Washington Post, etc. He’s afraid because actual journalists are revealing his criminal activities and those of his associates. His only recourse is a campaign of smear tactics. But that is only making him look even more guilty. So keep it up, Donnie. And remember, no matter how bad the ratings are for CNN, yours are still worse.